Charlton have released striker Jimmy Floyd Hasselbaink after only one season at The Valley. 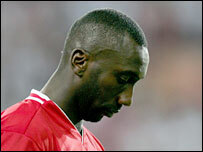 Hasselbaink joined Charlton last summer on a free deal from Middlesbrough, where he spent two successful seasons. But he did not transfer his goalscoring form and the 35-year-old scored only two goals in 25 Premiership appearances as the Addicks were relegated. The Holland international's last goal was in Charlton's 3-1 home defeat at the hands of Boro in January.